The crunch and pop of a perfectly boiled cob of corn as you bite into it is a simple pleasure many people look forward to every year. Quality corn on the cob is juicy and sweet and there's really no substitute. That is why it is so disappointing when you look forward to that ultimate cob of corn, only to get something chewy and tough instead. If you have issues with chewy corn, a few modifications are all it takes to reverse the situation and get corn just the way you want it. One of the issues that leads to chewy boiled corn is leaving the corn in the simmering water too long. Before you boil it at all, it must be shucked. This refers to removing the outer husk and the silky threads that remain attached. Wipe the cob with a damp paper towel if you have trouble getting the threads off. As for the boiling time, 5 to 7 minutes in boiling water should suffice. Any longer than this, and you will venture into the tough and chewy territory you're trying to avoid. Some people like to place the shucked cobs in a pot of cold water over high heat, and as soon as the water reaches a boil, the corn is done. If you tend to have problems with the texture of your corn, and boiling is your standard method of preparation, try mixing it up and see if you get better results. You can steam your corn for 8 to 12 minutes; roast it or grill it for up to 25 minutes at 475 degrees F; or even pop it in the microwave for 4 minutes at full power on one side, then flip it over and do 4 more minutes on the other. With steaming, shuck it the same as when you boil it, but with roasting, grilling and microwaving, peel down the husks to remove the silks, then pull the husks back up. One of these methods might give you the crunchy, moist corn you're looking for. Fresh, young cobs typically result in fresh-tasting corn on the cob, so cook your corn as soon as possible after you buy it. 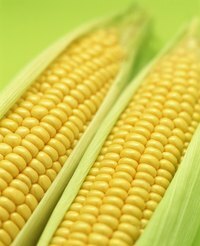 In the U.S., corn on the cob is in season from May to September, so do the bulk of your corn cooking during those months. Look for corn still in the husk, and husks that still fit tightly around the ear of corn and maintain their bright green color. Before you bring the corn home, take a moment and peel back a husk or two to ensure the kernels are in tight rows and look plump and healthy. You can probably leave corn on the cob laying around for quite some time and still technically cook it and eat it, but the quality won't be anything close to what you want. If you want to keep it for use during the "off months," perform a short freezing ritual so you can prevent that tough, chewy exterior when you cook it. The National Center for Home Food Preservation recommends scalding or blanching the corn briefly to stop the actions of enzymes that will affect the taste and texture of the corn later on. Nine minutes for medium ears of corn and then cooled in ice water before being drained and packed away in sealed freezer containers or freezer bags is the recommended way to go.